Dyana and I met while I was teaching surfing in Mexico in 2004. She has since become a good friend and recently has become an athletic and performance coach, transition coach, and facilitates FutureShaper Roundtables after years of owning her own business. I love this inspirational article she's written about learning to surf, surfing as a metaphor for life, and connecting with energy and ourselves. Read on, enjoy, and check out Dyana's website for more . If you were to ask this surfer that question, I would probably start with explaining that, for me, surfing is a powerful metaphor for life. Everything we can experience, sense, think, and do is literally vibrating energy. When I am riding a wave, I am not riding a wave of water, I am riding a wave of energy moving through water. The ocean is a medium that invites me to interact with the Earth’s energy at one of its most dynamic moments. An ocean wave hitting the beach is the culmination of wind energy transferred to water. Having traveled from many miles away, this energy finally meets the shallow bottom and heaves the ocean into the giant gaping maw of Mavericks or the peeling walls of machinelike perfection that have drawn hordes to Malibu for generations. Big wave chargers and longboard sliders engage with this energy in their own way, spontaneously navigating varying challenges, whether they be mental, spiritual, physical or environmental; surfing demands that we meet the ocean in the present moment and on her terms. I love the saying, “You can’t stop the waves, but you can learn to surf.” As we go through life and if we pay attention, we learn how to live life. We find the courage to overcome our fear of drowning that could keep us from ever paddling out in the first place, just as we endeavor to overcome the fears that keep us playing small in life and hinder us from achieving our potential. We acquire knowledge of board design and the tides, currents, and bottom bathymetry so we are perfectly positioned and equipped for the wave of the day just as we prepare and establish best practices in business to maximize opportunities when they present themselves. Surfing brings us face-to-face with our physical and mental limitations and provides us a play space to experiment and push through our limitations. Surfing informs us that when we are at play, our mind is at its most creative and innovative and that doing is work while being is effortless. A Buddhist proverb says that in the beginner’s mind there are many possibilities, but in the expert’s mind there are few. Surfing reminds us that no matter how many times we have surfed, no matter how experienced we think we are, as in life, there is always something to learn. The ocean has a knack for humbling the most experienced surfer or revealing a fresh way to connect with its energy. When I first started surfing, I was fortunate to get instruction from an accomplished big wave surfer from the North Shore of Oahu. I could not understand why he would want to spend time with a novice when he was readily accepted at the most competitive and technically difficult breaks on the North Shore. When I finally asked him, his answer was simple: He said that after a lifetime of surfing, he found he could reconnect with his original joy simply by working with newbies; he understood how the expert learns from the beginner. For me at the time, just making a wave was cause for celebration. The surf learning curve can be quite steep. I learned early on that the only way to make sense of the experience was to celebrate every progression and revere every new insight, no matter how small. In other aspects of life we rarely allow ourselves such indulgences. Experts, if they take the time, learn that hanging out with beginners can be quite a party. After every session we return to the shore, exhausted and breathless, eager to carry on the tradition of regaling our companions with tall tales about the huge waves we rode. It was in those moments, when my body was physically spent and my mind buzzing with a new kind of exhilaration, that I began to perceive myself differently; I bonded with my heart and soul in a new way. I had a new identity and I relished getting to know me, the surfer. Just like our most challenging relationships teach us about ourselves, our relationship with surfing and the ocean holds up a mirror and points it directly back at us. The ocean is mysterious, powerful, and exquisitely deadly. It is the source of life on our planet and reflects Earth’s movement through the heavens in its tides and currents. When we step from land into the liquid depths of the sea, we are stepping into a primal mystery. It is at once the dark night of the soul and an ecstatic expression of abundance and life itself. Dichotomies like this abound in surfing and trying to make sense of it in some linear, logical way is futile. Similarly, it is often impossible to make sense of the events that occur in our lives and in the world around us—we can fight it or we can simply accept what is. Gerry Lopez, aka “Mr. Pipeline” wrote in his book Surf is Where You Find It, “There needs to be a calmness that allows the surfer to be centered and aware of all that is happening around him without becoming unnerved. Although instinct isn’t the right word, something like it, along with a clear mind, work better than thinking because, at Pipe, there isn’t enough time for thought. A Zen-like mind that is empty of thoughts allows a stronger connection with the wave.” What Gerry is talking about is not sport and may not even be art, but he is talking about tuning in to the present moment and becoming conscious enough so that the surfer becomes the wave rather than experiencing himself apart from the wave. So next time you are at the beach and you cross paths with someone who has just come out of the ocean, ask them why they love their sport. And if you encounter a certain brand of surfer and clumsily refer to what they do as a sport, they will set you straight and explain that any activity that moves us to raise our level of awareness in perfect alignment with the present moment, allowing us to glimpse that Divine oneness, is on a level apart from mere sport. Perceiving surfing through this profound lens is a gift. I embrace surfing as a metaphor for life, my life—and what a wonderful life it is. The Santa Cruz Longboard Union hosts the annual Memorial Day contest at Steamer's Lane. It is a great surfing community event with great people and often challenging conditions. The kelp, rocks, and sometimes huge surf make for interesting heats. There are many age divisions which give everyone a chance to surf with/against their peers. I'm in the women's 20-34 age division (for one last year!) and can't wait to surf "The Lane" with only a handful of ladies in the water. If you're in the area, stop by the Lane to check it out! The event entry fees and raffle tickets raise money for the Ride A Wave organization, which is a volunteer group takes kids with special needs surfing. Here is a link to the heat sheets and contest schedule. Stories from inspirational ladies about surfing big waves, making films, building surfboards, and riding professionally. I am honored to be participating in a panel discussion titled "The Other Side of Surfing" on Thursday, April 23rd from 7pm-9pm at the California Institute of Integral Studies. At a time when surfing is changing and some are fighting to maintain the status quo, we are shifting the spotlight onto the other side of surfing. Join us for a curated conversation with Ashley Lloyd Thompson, Tiffany Campbell, Bianca Valenti, and Julie Cox about international surf culture, the herstory of surfing, the industry, and more. Ashley Lloyd Thompson is one of few women who are internationally recognized for her work as a surfboard shaper. She signs every board she shapes, "Made with love," which is an attitude that permeates all that she does. In the shaping room she crafts with passion and purpose, and in the water her elegant yet playful style is contagious. Over the past twelve years she has been honing her craft and creating her own surfboard brand, Ashley Lloyd Thompson Surfboards. As a new mom, Ashley and her husband are navigating parenthood while maintaining her shaping business. Tiffany Campbell is a filmmaker who focuses on surfing and skateboarding. Tiffany and Andria Lessler's debut film, Dear & Yonder: Daring Stories of Ladies United by the Sea, won SURFER Magazine's Breakthrough Filmmaker Award in 2009. For over a decade she has been involved with Villa Villa Cola, a collective of artists, filmmakers, skateboarders and photographers that produce videos and zines that encourage more girls to skate. Bianca Valenti became the first female Big Wave World Tour Champion in 2014. Proof Lab, a surf shop in Marin, sponsors her. Currently, Bianca's big wave riding is being filmed for the documentary, It Ain't Pretty: A film about women who surf Ocean Beach in San Francisco, scheduled for release in 2015. Julie Cox was a team rider for Roxy for eight years, during which time she competed around the world. In the Women's Longboard Tour, Julie placed fifth in the world three years running. She was the Director of the California Surf Museum, a non-profit organization dedicated to preserving surfing heritage. She also launched The Jule Collection, a line of women's surfboards, with shaper Jed Noll. Currently, she gives surf lessons locally and abroad, and works for Aviator Nation on Haight/Ashbury. Margaret Seelie is a native Ohioan who moved to California and started surfing in 2009. Since then she has been writing, letterpress printing, educating, and aspiring to shape surfboards. She is always looking for new ways to share inspiration and stoke with those around her. We will be hosting a raffle in conjunction with this event! Tickets will be available for $3 each or 2 for $5. Come early to buy tickets and we will announce the winners at the end! Must be present to win. 100% of money raised from the raffle benefits CIIS Public Programs & Performances Workshops Scholarship! This scholarship will give CIIS workshop access to students and people in the community who may not be able to afford them. April is the month of the Diamond. These strong and sought after gems are the namesake of my favorite surfboard in the Jule Collection line. Mollusk Surf Shop in San Francisco currently has a 9'4 and 8'8 Diamond model in stock, which Jed Noll has meticulously shaped with stability, noseriding, and classic longboarding in mind. Each beauty is glassed for strength and durability, making the diamond a board you are proud to own for a lifetime. If you are looking for a new board this spring/summer, check out the ones at Mollusk and feel free to contact me with any questions or to try a demo board. I can also work with you to order a custom Diamond in a different color/length (3 month turnaround time). This board works great at all longboard spots and is designed for someone 5'4 - 6'0 tall x 100lbs - 160lbs. Shine on! I have been out of the water for a couple weeks recovering from Surfer's ear surgery. What is Surfers ear? I wish it was some keen new sense I gained from surfing that gave me special powers to discern wave speed and conditions. But, it's not that rad. Why couldn't surfing have transformed my body and given me gills or webbed fingers instead? Here's the skinny on Surfer's Ear. "Surfer's ear" or as it is medically known - "exostosis of the external auditory canal"- is a condition of bone growth in the ear canal caused by the cooling effect of cold water and wind. Cooling of the ear canal stimulates bone production by the cells that line the ear canal, and when extensive both growth occurs, the ear canal narrows and can easily become blocked by trapped water and ear wax (gross!). The growth of bone in the ear canal takes place over many years and can be lessened by wearing ear plugs and or a neoprene hood when surfing. Basically, my ear was trying to protect itself and growing to cover the canal from the cold wind and water. I should have been wearing ear plugs all along, especially those evening sessions at Pleasure Point. The surgery was painless thanks to Dr. Douglas Hetzler in Santa Cruz. He is the man when it comes to Surfers ear. Thanks to him I can hear better and life is almost back to normal... only a few more days out of the water. The Women on Waves exhibit on display at the California Surfing Museum is no small feat. (published on Surfline June 2, 2010- Note: The exhibit is now over) It traces the 300-year lineage from the surfing queens of Hawaiian myth and history to the newly-crowned women's surfing champions of the 21st Century. The exhibit is about how women's surfing has evolved from something that was taboo to the current, ultra-high-performance level as practiced by gals such as Steph Gilmore, Keala Kennelly, Maya Gabeira and Layne Beachley. 1940s and 1950s Balsa and redwood hotcurl boards. Hollywood's Esther Williams and pioneer Marge Calhoun. 1960s Gidget, Linda Benson, wetsuits, boom in surfing popularity. 1970s Hand knitted suit by Jericho Poppler for the "Golden Girls" who raised awareness for women's surfing. 1990s Lisa Anderson, Blue Crush, Resurgence of Longboarding. 2000s Stephanie Gilmore, Keala Kennely, Bethany Hamilton. Three of the 40+ panels on display at Women on Waves show one of Lisa Andersen's boards next to an original pair of Roxy boardshorts - the trunks that launched an industry. Next to that is a tribute to Blue Crush featuring Sanoe Lake's board. And off in the distance, Sarah Gerhardt's Mavericks special. There was a time when most women took to the waves only in the company of a gentleman, because boards were heavy and taboos were strict about what women could expose when they went into the water. In 1914, Isabel Letham defied her father when she went tandem surfing with Duke Kahanamoku, and defied Victorian culture when she wore a risqué "Canadian" swim costume which was made for performance more than prudence. Eighty years later, Lisa Andersen didn't like how her behind looked in a bikini -- and also didn't like worrying about her two-piece suit coming off in contests -- so she innovated a pair of performance women's surf trunks that revolutionized the surf industry. In between, Women on Waves shows how women's surfing and women's beach fashion paralleled each other, as women of the 20th Century crossed a line in the sand and took to the waves, and wanted to wear bathing-suits that went against the grain of the times -- and in so doing had a major influence on changing what women wore in the ocean. Women's-performance influenced fashion and vice versa, and Women on Waves also details the ascent of women's surfing from a time when women could barely lift the heavy hardwood boards of the early 20th Century -- to now, when women surfers are going bigger, faster and deeper on modern equipment. And that modern equipment was also influenced by women surfers such as Darrilyn Zanuck, whose need for a shorter, lighter hardwood surfboard in the late 1940s inspired Joe Quigg to make "The Darrylin Board" which is considered by many to be the Eve of the modern shortboard. 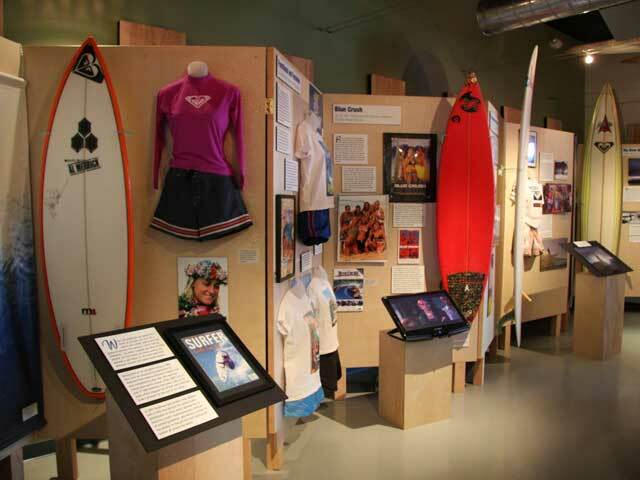 Women on Waves was put together by Jim Kempton, Julie Cox, Jane Schmauss and Tara Torburn at the California Surf Museum in Oceanside, with help from Ben Marcus and many of the women and shapers featured in the exhibit. The exhibit consists of more than 40 panels -- from ancient Hawaii to Steph Gilmore -- with photos and three dimensional displays of famous surfboards, swimwear and other icons and jetsam from women's surfing history. The exhibit includes more than 35 surfboards, from the kind of alaia ridden by Princess Ka'iulani, to the board Bethany Hamilton was paddling when she was attacked by a shark on the island of Kauai. The surfing world lost a surf legend on January 8th, 2015. Shelley Merrick was a mother, grandmother and dedicated surfer late into her 60s when she passed away from a stroke. Shelley was one of the early Board Members of the Surfrider Foundation, she lobbied for a women's division in the Malibu Surfing Association Classic, and many people admired her grace on the water and land. I looked up to her lifelong dedication to surfing. She would surf Leo Carrillo in the morning and then get dressed in her business attire and head in to work as the Executive Director of the Strawberry Festival in Oxnard. When I was in high school, Shelley taught me about artificial reefs and helped me write my senior thesis on the topic. Since then, she gave me career and life advice and we kept in touch via email. We got to see each other in 2010 at the "Girl in the Curl" women's surf conference at Pepperdine University. I'm so lucky to have known her. "Hang Ten and Call me in the Morning", is a great article about Shelley's surfing life published August 27, 2008. Shelley Merrick surfing Latigo in 1962. Photo from Merrick Family Collection. On January 4th, 2015, we kicked off the new year with a few surf students during a group lesson in Bolinas. Bolinas is a great beginner-intermediate spot north of SF about an hour's drive. It was sunny, 1-2', with mushy waves, and for the first 45 minutes we were the only ones in the water! Everyone caught a couple of waves, worked on wave timing, paddling, paddling and more paddling. We enjoyed the company and beautiful scenery of the area. So much fun! Click here for more about group lessons. Suzanne on a nice one. Jill, Suzanne, Kristin, and Julie heading out. With the holidays recently gone, many of us have been living in the present moments, focused on enjoying family and friends. Making meals, warming by a cozy fire, traveling to a favorite getaway or to see family. As the new year starts to unfold, we've taken some time to reflect on the past and bring on fresh goals for the coming year. Along with new personal and work goals, I usually have a general "surf more" resolution. Work, family, time with friends, and excuses about the imperfect surf conditions can keep me out of the water. But whenever I've been surfing, I always feel refreshed, invigorated, and like I've made the most of my day. I love that feeling and want more of that in 2015! I am making a plan to get out of the house in the mornings and surf at least 3 times/week, no matter the conditions. If "surf more" is one of them and you'd like some accountability and encouragement along the way, I'm offering a package of 6 lessons for $800. Each package includes a surf journal for creatively recording your sessions and six 2 hr surf sessions with me. Each package also includes at least 6 photos of you in action. Lessons can be scheduled 2 times per month to spread it out, or all in a row, however you like. Contact me here if you're interested in package lessons. It has been a rainy winter so far in Nor Cal. I'm stoked because we need it! I'm bummed because the runoff and overflowing water treatment plants empty into the ocean making for dirty water with high bacteria levels. A good rule of tumb is to wait 72 hours after storms to surf again. I have gotten sick from dirty water in years past, but also have been fine after rainstorms. It is a tough call, but probably best not to risk getting sick. If in doubt, don't go out. You can "mind surf" and do some yoga instead! 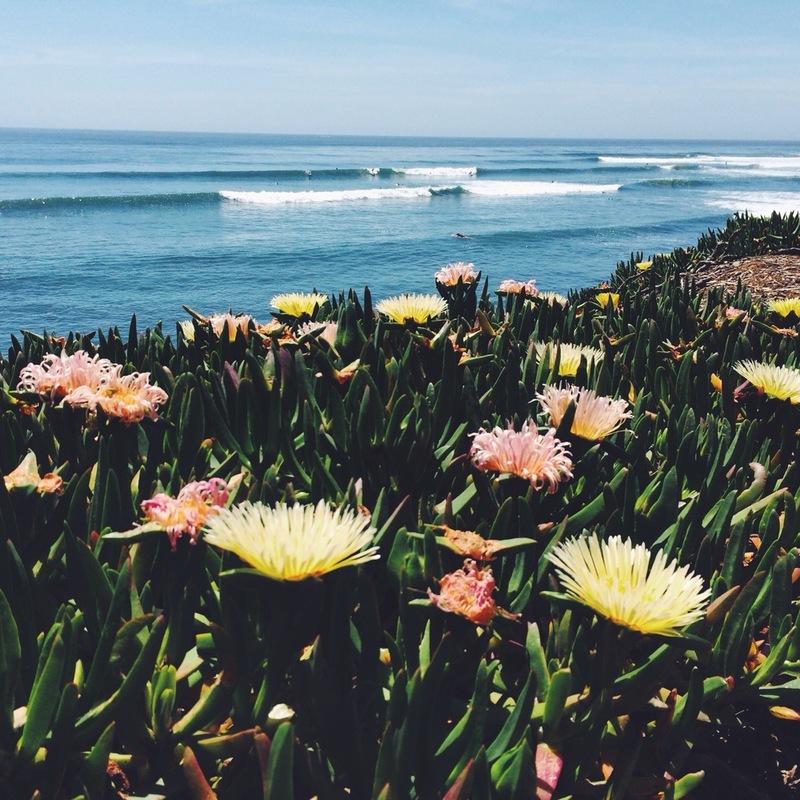 Malibu's Surfrider Beach is one of the best waves in California and a spot I grew up surfing. Early in September 2014, I had the opportunity to surfing in the annual Malibu Surfing Association Classic, one of my favorite contests of the year. This year a hurricane produced 4-6 foot waves at 1st Point in sunny and glassy conditions. Best of all, only a handful of girls are in the water during the heats, so you have the wave all to yourself. Malibu breaks over a sand-and-rock bottom and produces a beautiful right-breaking wave. The wave reels for 100 yards, which gives plenty of time to let your surfing style shine through. I placed 5th in my division (Women ages 30-39)and had fun in each heat surfing the racy sections, hanging five, and wearing only a Seea bikini in the warm water. The MSA event is always a great time visiting with old friends and watching great surfing. I hope everyone caught some waves this summer and perhaps the best are still to come as the waves have been non-stop here in California. If you're interested in a coaching session, shoot me an email and let's set up a time to get in the water together. Rel on the Dipsea Trail in Marin. One of the great things about surfing is that you're getting a workout OUTSIDE of a gym! You're in the beautiful outdoors smelling seaweed and salty air while watching birds dive for their dinner. Your gym is the great outdoors and there are so many ways to take advantage of it. Although paddling and riding waves does provide a great aerobic workout, strength training, and Vitamin D, there are 3 great activities you can do to improve your surfing while on land. Ten minutes of yoga every morning: Stretch out that tight neck and shoulders, loosen the lower back, and get your balance practice on. Yoga is my go-to practice for pre- and post-surf remedy. Go to You Tube and get your daily dose. 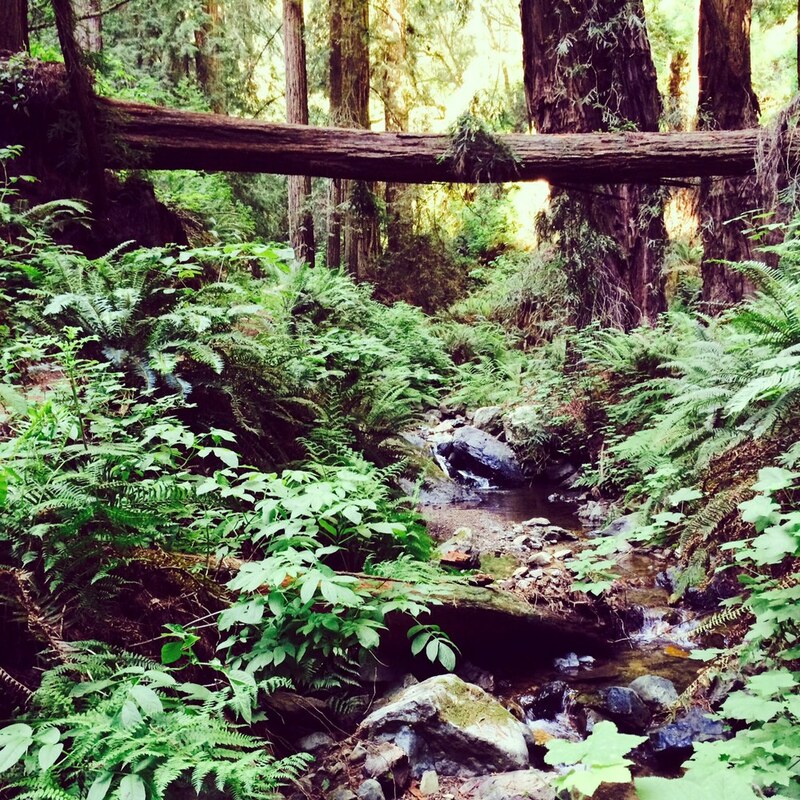 Take a hike: If you live in Santa Cruz or in the Bay Area, you know how many killer hikes we have in our backyards It is insane! You could find a new hike everyday for 365 days and still be discovering new trails. 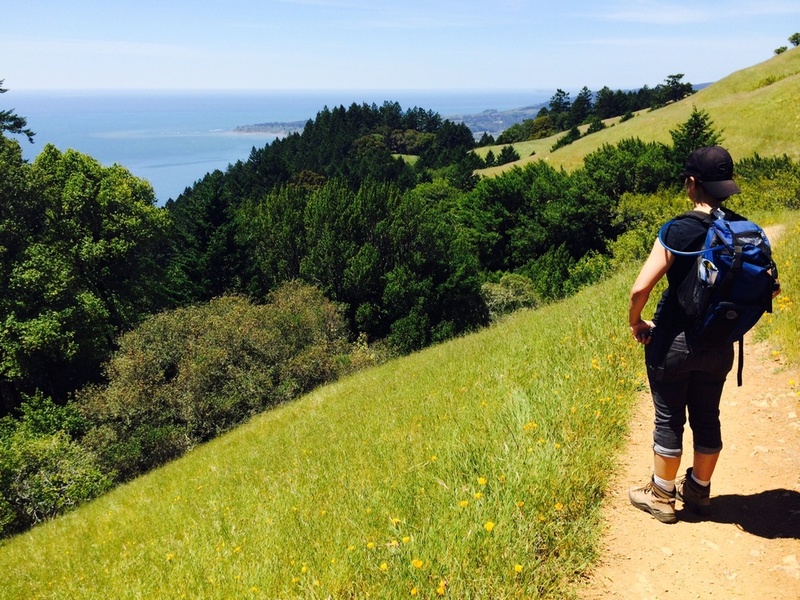 Hiking is great for straightening legs, back, torso, and and for aerobics. Biking: So good for your quads and back! You'll be doing much stronger turns and will be able to noseride for longer periods of time if your legs are strong. Again, with so many trails and paths in the area, it is awesome! Choosing where to paddle out can be the make or break decision of your day. Paddling out at the right spot can have you feeling like a wave magnet, in the groove, and stoked on your session. Paddling out in the wrong place can be a frustrating and demoralizing experience. The waves can look good from the beach, but then back off as you try to catch them, the crowd might be too thick, or the currents too strong. Recently, I paddled out in the middle of a really crowded spot with a current pulling north. It looked good from the beach, but every wave I tried to catch had 3 people already going for it and many more in the way as I dropped in. It was dangerous, I was tired of fighting the current to stay in position, and I was super annoyed with my session. After 45 minutes of struggling, I got out of the water and decided to give it one more chance at a peak I noticed breaking 100 yards away. Sure enough, I caught a nice waist high right and discovered my stoke. Find those certain peaks and surf spots that work for you and surf them often. You'll become a better surfer by knowing where to go and though you may have to jump in the car for an adventure, it will be worth the effort. The best way to end your wave is to KICKOUT! Think about how you end your waves. Do you jump or fall off? Do you surf all the way to the beach until your fins hit the sand? Do you even think about stopping or ending your ride with control? Well, you should! Think about getting off of the wave by pivoting your body toward the horizon. When you're done with the wave: 1. Put most of your weight on your back foot to stall. 2. Think about your arms and hands leading you to the horizon. 3. Instead of riding in toward the sand, watch the nose of your board go toward the "outside" and you'll be off the wave. 4. Get back down on to the board and paddle back out for more. Try it out!